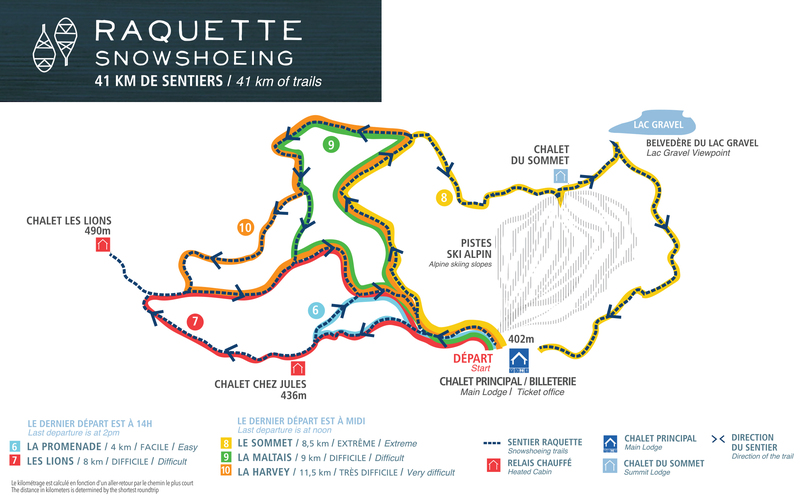 Mont Grand-Fonds at an elevation of 735 meters proposes 21.5 kilometers of trails for all levels. The trails share the same starting point, form loop circuits at the base and top of the mountain and go by heated shelters. The 4-kilometer La Promenade trail is part of the base’s paths and is designed for the whole family. From Québec City, take Route 138 East to La Malbaie. From there, cross the downtown bridge. Follow the west shore of the Rivière-Malbaie and turn right on the chemin des Loisirs. Follow the directions on the blue panels. It is always important to obtain information from the trail manager before setting out on the trail.